With the 2018 Tokyo Auto Salon scheduled to kick off in under two weeks, multiple photos of modified cars from participating Japanese brands have started circulating online. 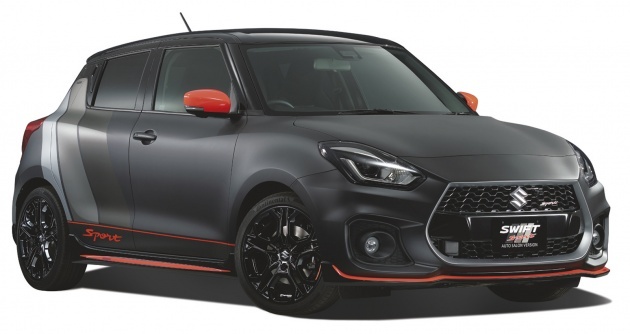 The set of four from Suzuki is particularly interesting, especially this matte black Swift Sport. Visually, we like the overall stealthy look, thanks in part to the new set of wheels (possibly larger than the stock 17-inch set) and contrasting bright red accents. The car – themed after the GSX-S1000 superbike that will be displayed alongside it – is also evidently lowered, adding further drama to the already imposing front fascia. Speaking of which, the grille surrounds is finished in satin grey and the abridging plate holder plastic is given a gloss black coat. Suzuki hasn’t revealed details pertaining to its mechanical upgrades, if any, but here’s a quick recap on the standard, third-generation triple S. Power comes from the K14C 1.4 litre Boosterjet engine (from the Vitara), producing 138 hp at 5,500 rpm and 230 Nm of torque from 2,500 to 3,500 rpm. Although power isn’t up by much compared to the previous M16A-equipped Swift Sport, there’s significantly more torque – 70 Nm more – than its predecessor’s naturally-aspirated motor. Another unique model to go on display at the show is the XBEE Winter Adventure (pictured above). 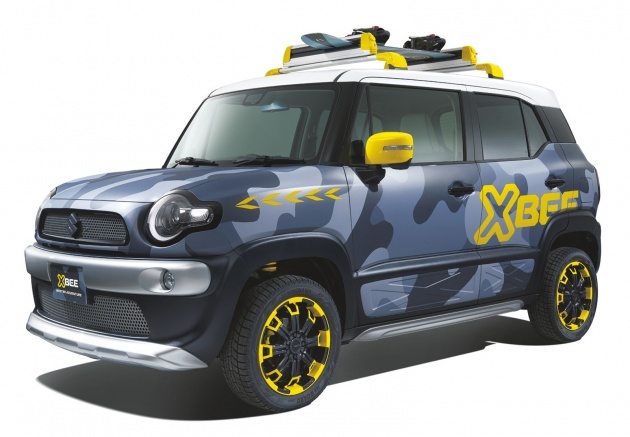 It’s based on the new XBEE crossover wagon (pronounced as cross-bee) and features no less than four shades of blue camouflage (military-style) wrap, complete with striking yellow accents and a roof rack. Don’t be fooled by its appearance, for it is only 3,760 mm long – that’s 135 mm shorter than the new Myvi! Under the bonnet of the standard XBEE is a K10C 1.0 litre direct-injection three-cylinder turbo engine with a mild hybrid system. On its own, the twin-cam VVT unit makes 99 PS at 5,500 rpm and 150 Nm from 1,700 to 4,000 rpm, while the tiny electric motor offers 3.1 PS at 1,000 rpm and 50 Nm at 100 rpm. A six-speed automatic transmission is standard. Several other Suzuki cars that will form the display setting are the Solio Bandit, Alto Works and Wagon R Stingray. There’s also the Carry kei-truck that’s rigged for fishing and a camper version of the Spacia, aptly called the Spacia Tall Camper. The 2018 Tokyo Auto Salon will take place from January 12 to 14, 2018, at the Makuhari Messe convention centre in the Chiba prefecture. Drb suzuki! Bring in Swift nao! The Swift front is awesome design…but rear light design quite awful. in malaysia, suzuki is struggling to survive. it takes a lot of marketing budget to take the big names by their horns. berjaya mazda super impressive, suzuki myb? Suzuki Swift Sport the power is 140ps and 230nm with the price 100k or less (under Proton should be cheaper) what else you expect? Decent power with decent price. Proton don’t neglect your Japanese gf after getting China gf. Reality = So long boys.. Previous Post: Ferrari 488 Speciale currently under development?